Minerals are the natural, inorganic (nonliving) materials that compose rocks. Examples are gems and metals. Minerals have a fixed chemical makeup and a definite crystal structure (its atoms are arranged in orderly patterns). Therefore, a sample of a particular mineral will have essentially the same composition no matter where it is from—Earth, the Moon, or beyond. Properties such as crystal shape, color, hardness, density, and luster distinguish minerals from each other. The study of the distribution, identification, and properties of minerals is called mineralogy. Almost 4,000 different minerals are known, with several dozen new minerals identified each year. However, only 20 or so minerals compose the bulk of Earth's crust, the part of Earth extending from the surface downward to a maximum depth of about 25 miles (40 kilometers). 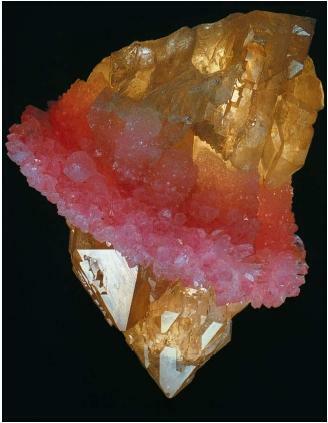 These minerals are often called the rock-forming minerals. Mineralogists group minerals according to the chemical elements they contain. Elements are substances that are composed of just one type of atom. Over 100 of these are known, of which 88 occur naturally. Only ten elements account for nearly 99 percent of the weight of Earth's crust. Oxygen is the most plentiful element, accounting for almost 50 percent of that weight. The remaining elements are (in descending order) silicon, aluminum, iron, calcium, sodium, potassium, magnesium, hydrogen, and titanium. Crystal: Naturally occurring solid composed of atoms or molecules arranged in an orderly pattern that repeats at regular intervals. Element: Pure substance composed of just one type of atom that cannot be broken down chemically into simpler substances. Metallurgy: Science and technology of extracting metals from their ores and refining them for use. Ore: Mineral compound that is mined for one of the elements it contains, usually a metal element. Rock: Naturally occurring solid mixture of minerals. Silicate: Mineral containing the elements silicon and oxygen, and usually other elements as well. Most minerals are compounds, meaning they contain two or more elements. Since oxygen and silicon together make up almost three-quarters of the mass of Earth's crust, the most abundant minerals are silicate minerals—compounds of silicon and oxygen. The major component of nearly every kind of rock, silicate compounds generally contain one or more metals, such as calcium, magnesium, aluminum, and iron. Only a few minerals, known as native elements, contain atoms of just a single element. These include the so-called native metals: platinum, gold, silver, copper, and iron. Diamond and graphite are both naturally occurring forms of pure carbon, but their atoms are arranged differently. Sulfur, a yellow nonmetal, is sometimes found pure in underground deposits formed by hot springs. A mineral's physical traits are a direct result of its chemical composition and crystal form. Therefore, if enough physical traits are recognized, any mineral can be identified. These traits include hardness, color, streak, luster, cleavage or fracture, and specific gravity. Hardness. A mineral's hardness is defined as its ability to scratch another mineral. This is usually measured using a comparative scale devised in 1822 by German mineralogist Friedrich Mohs. The Mohs hardness scale lists 10 common minerals, assigning to each a hardness from 1 (talc) to 10 (diamond). A mineral can scratch all those minerals having a lower Mohs hardness number. For example, calcite (hardness 3) can scratch gypsum (hardness 2) and talc (hardness 1), but it cannot scratch fluorite (hardness 4). Color and streak. Although some minerals can be identified by their color, this can be misleading since mineral color is often affected by traces of impurities. Streak, however, is a very reliable identifying feature. Streak refers to the color of the powder produced when a mineral is scraped across an unglazed porcelain tile called a streak plate. Fluorite, for example, comes in a great range of colors, yet its streak is always white. Luster. Luster refers to a mineral's appearance when light reflects off its surface. There are various kinds of luster, all having descriptive names. Thus, metals have a metallic luster, quartz has a vitreous or glassy luster, and chalk has a dull or earthy luster. Cleavage and fracture. Some minerals, when struck with force, will cleanly break along smooth planes that are parallel to each other. This breakage is called cleavage and is determined by the way a mineral's atoms are arranged. Muscovite cleaves in one direction only, producing thin flat sheets. Halite cleaves in three directions, all perpendicular to each other, forming cubes. However, most minerals fracture rather than cleave. Fracture is breakage that does not follow a flat surface. Some fracture surfaces are rough and uneven. Those that break along smooth, curved surfaces like a shell are called conchoidal fractures. Breaks along fibers are called fibrous fractures. of 1.0. When pure, each mineral has a predictable specific gravity. Most range between 2.2 and 3.2. (This means that most are 2.2 to 3.2 times as heavy as an equal volume of water.) Quartz has a specific gravity of 2.65, while the specific gravity of gold is 19.3.
civilization, from microprocessors made of silicon to skyscrapers made of steel. Gems or gemstones are minerals that are especially beautiful and rare. The beauty of a gem depends on its luster, color, and hardness. The so-called precious stones are diamond, ruby, sapphire, and emerald. Some semiprecious stones are amethyst, topaz, garnet, opal, turquoise, and jade. The weight of gems are measured in carats: one carat equals 200 milligrams (0.007 ounces). 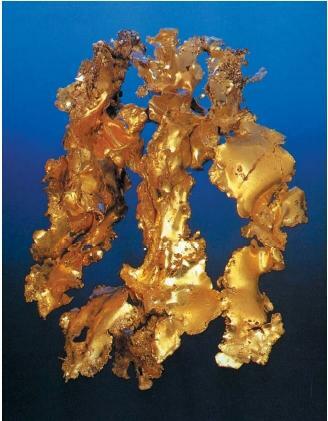 Precious metals have also acquired great value because of their beauty, rarity, and durability. Platinum, gold, and silver are the world's precious metals. Other metals, although not considered precious, are commercially valuable. Examples include copper, lead, aluminum, zinc, iron, mercury, nickel, and chromium. A mineral compound that is mined for a metal element it contains is called an ore. Metallurgy is the science and technology of extracting metals from their ores and refining them for use. Iron, which alone accounts for over 90 percent of all metals mined, is found in the ores magnetite and hematite. These ores contain 15 to 60 percent iron. Other ores, however, contain very little metal. One ton of copper ore may yield only about eight pounds of copper (one metric ton may yield only four kilograms). The remaining material is considered waste. Great resource for eveyone who wants to know more about minerals in detail. This article has covered many areas prior to mineral properties and differences between certain vocabularies in this topic. It really helped me to understand and i think after reading this article i have got many of my concepts clarified. And the links at the bottom of the article, were very useful as well. Thank you for the generous information, i found this very resourceful for my exams. This article gave me a lot of understanding about some of definitions.